The new permanent ramp has been purchased and installed. Thank you to Tom Wekony and the Property Committee for coordinating this project. Now we have wheel chair and walker access from the lower level of the church to the Fellowship Hall. $2650 from Vision 2020 supported this project. 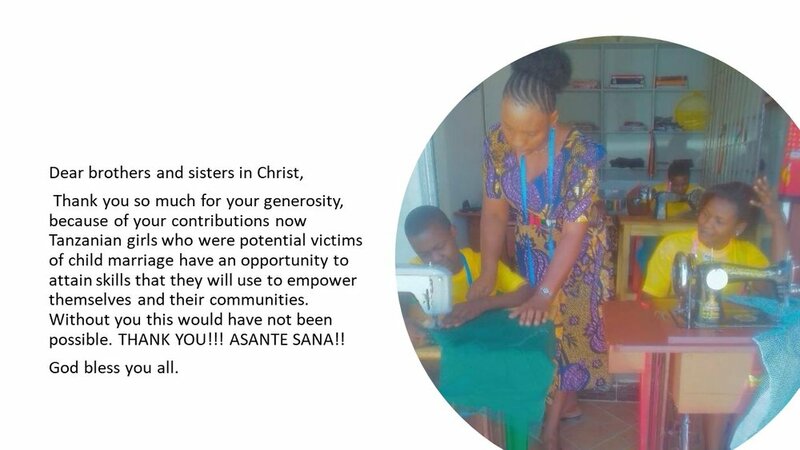 Vision 2020 provided $2850 to Ms. Frida’s program to Empower Tanzanian Girls Through the Arts. Our gift enabled Ms. Frida to be able to rent a larger space and purchase sewing machines and materials. This program allows young women to learn a skill that will help support their future. Shabira Bocko will be keeping us informed on the success of this program. Bill Reidinger and the Mission Team have sent a recommendation to the council regarding a local organization that would benefit from our support. Stay tuned for more about this potential outreach opportunity. The Council recently approved the introduction of an Equipping Ministry at Christus Victor. You might look at this as coordination of volunteers for our many programs. However, it is much more than that. The goal of the Equipping Ministry is to provide our youth and adults with the ability to identify their spiritual gifts and interests and then match those gifts with volunteer and service opportunities in the church and community. More information will be available soon. Thank you for your generosity towards the Vision 2020 Mission Plan. If you made a commitment we are counting on your continued support as we focus on Phase 2 goals. If you did not make a commitment, it is not too late to make a weekly, monthly, or annual commitment. Individual gifts are also welcome at any time by using the blue envelopes located in the pew pockets. Vision 2020 got off to a great start. We, the Congregation of Christus Victor, are almost halfway to our initial goal of $500,000 over 3 years. At the end of 2018, we have 3 year commitments of $232,000. During that same time we surpassed our First Phase goal of $80,000 to cover the replacement of a portion of the roof and new fascia. In addition, we honored our promise to set aside 10% of gifts to support local and global mission. As of December 31, 2018, we have received $95,662. A breakdown of expenses and balances are provided below. Elk Grove Cares Program- This project has not required monetary support. We provided an education forum with Mayor Johnson. We have also placed a Narcan kit in Hebrews Café to be used in the event of a suspected overdose. The focus of Phase 2 is Restructuring for Growth. The Executive Council and Council members are working on a plan that will prepare Christus Victor to successfully move into the future. More details will be shared in the coming weeks. Phase 2 of Vision 2020 will also include finalizing a plan for permanent accessibility for wheelchairs and walkers to the upper level. The property committee is seeking the best and most financially responsible way to meet this goal. *Please consider your Vision 2020 gifts as an addition to your regular weekly gifts that support operations and ministries. We are off to an outstanding start with the Vision 2020 Mission Appeal. 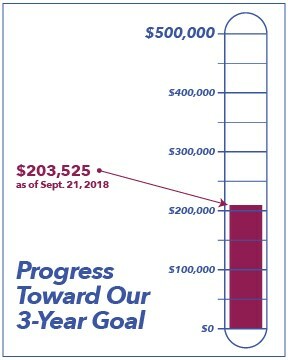 Three-year commitments to date total over $200,000, and at the time of publication, we were very close to meeting our First Phase $90,000 goal. Thank you very much to all who have submitted Commitment cards to make the First Phase such a wonderful success! Making a commitment provides you with a guide to faithful sharing of your treasures but also gives the church council a perspective on anticipated gifts as they prioritize and initiate Vision 2020 Mission Appeal projects. The Vision 2020 Mission Appeal will be identified by Phases and will continue for three years through 2021 until the $500,000 commitments goal is achieved. First Phase gifts will allow for replacement of the oldest section of roof that is critically damaged and replace the wheelchair lift in the Fellowship Hall area. Additionally, 10% of funds will be allocated to global/local mission outside of Christus Victor. The Second Phase will begin in early 2019. The Second Phase will focus on Repositioning for Growth. Funds will support an effective music ministry transition and provide seed money for two new positions, Operations Manager and Equipping Ministry Coordinator. If you have not had a chance to make a commitment, Commitment cards are still available in the pew pockets or one can be mailed to you upon request. Blue envelopes are the official envelope of the Vision 2020 Mission Appeal. Envelopes can also be found in the pew pockets. If you would like to make a weekly or monthly contribution, we have prepared packets of envelopes that can be found at the Welcome Center in the Narthex. Vision 2020 Mission Appeal gifts can be made easily through direct deposit, e-giving, or mailed checks but must be identified as Vision 2020 to ensure appropriate designation. The Vision 2020 Mission Appeal Leadership Team is committed to keeping the Congregation informed of ongoing progress of the mission appeal and each new initiative. Watch for monthly updates in the Communicator and on the CVLC Facebook page as well as here on our website.